Ottoman Turkish Restaurant is housed in the former home of Black Door on Clayton street (and has been many things over the years – Indonesian, pub grub, Asian fusion). Turkish seems to have been the most popular though, and it’s a nice place to grab a very reasonably priced lunch. The story goes that the head chef and the manager of Red Mezze (another great Turkish restaurant near St James Park) decided to open their own place a few years ago. If you’ve been to either and met the charismatic manager you’ll agree that his dry sense of humour is an acquired taste but once you understand it’s all in jest you warm to him. Case in point; we visited with our friends AR and UC – who has a severe peanut allergy – and asked if they use peanuts. His answer made some of us (who know him) chortle…”Does he have an epi-pen?” We replied in the affirmative. “He’ll be fine then” he winked and walked off. (He later came back and confirmed that there were no peanuts, only pine nuts). Anyway I digress. The restaurant itself is long and narrow, dark (except for the widow seats at the front) and decorated with nods to the Ottoman Empire – and a flat screen telly playing a Turkish channel, but don’t let that put you off. 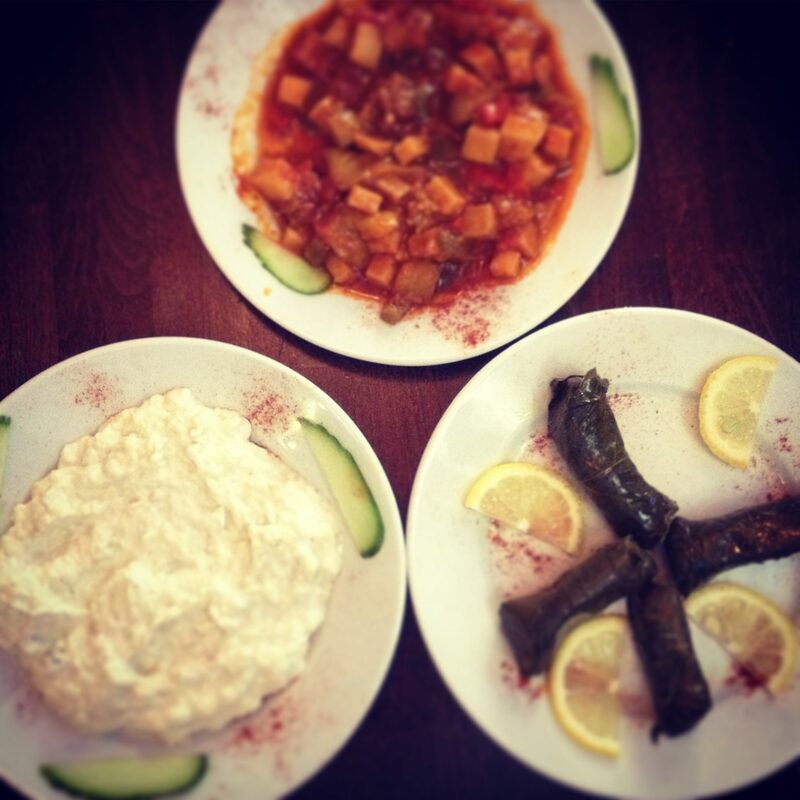 We settled on Ottoman’s very reasonably priced lunch special, which consists of a starter and main for £7.95 (Mon-Sun, 12-4pm). Despite having gone up by £1 and dropping a starter (you used to get two, the Mr grumbled) the quantities are large and it’s still very good value. We each chose a different starter – patlican ezme (aubergine, garlic and yoghurt dip), broad beans, humous, saksuka (aubergine, potato and peppers). I also ordered some dolmades (stuffed vine leaves) because, well, why not? They were delivered with a basket of very moreish warm Turkish bread. Little Dude loves his food and we felt he was ready for his first Turkish experience so bits of our starters were placed on his high chair tray and he started shrieking with delight! LD and I shared patrician ezme, which was creamy and on the right side of garliciness. The warm bread was perfect for dipping into it. The vine leaves were perhaps not the best I’ve ever had, but pretty good none the less. Houmous was very smooth and as it should be – although perhaps a bit plain on its own, better in combination with bites of other food. The Satsuka is more of a chunky tomato based cold vegetable dip, LD didn’t like it but the Mr enjoyed it – very succulent aubergine with flavours that complemented each other well. Now for the mains. AR and I both went for falafel, which was presented on a bed of humous with a little salad in the middle. 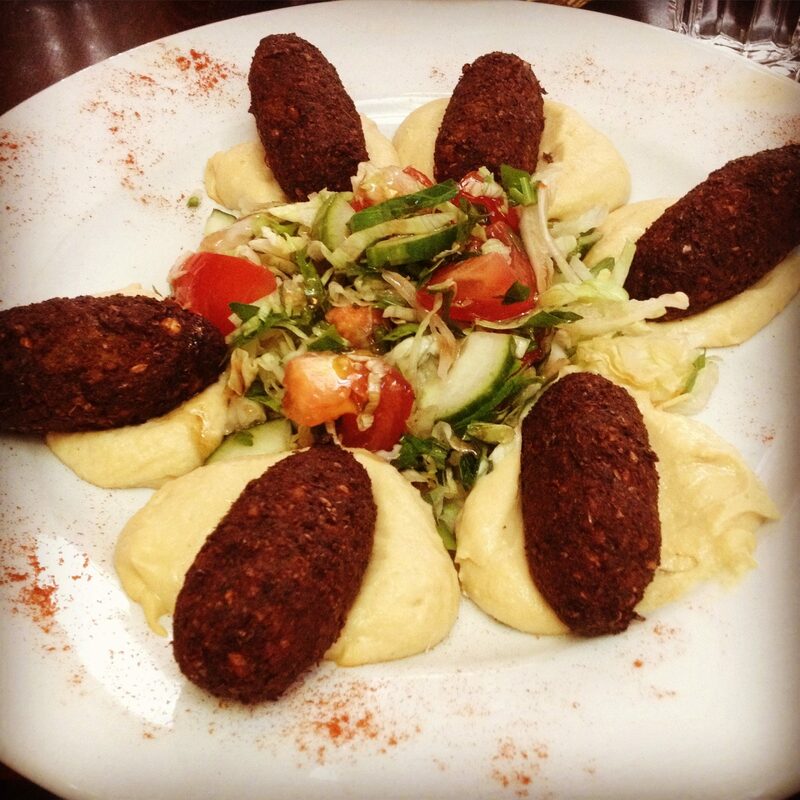 The portions are more than generous and the falafel was delicious – freshly cooked, crispy shelled and perfectly seasoned, they were among some of the best falafel I’ve tasted. 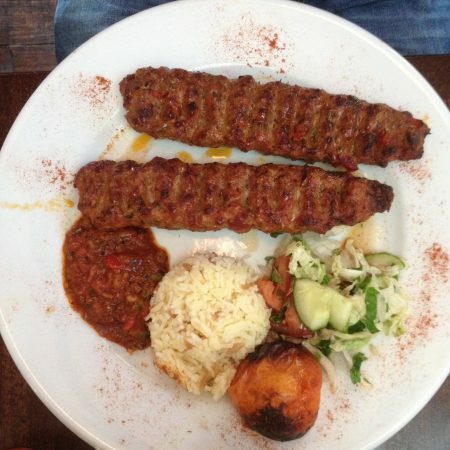 The Mr and UC both went for meat, Adana (minced lamb skewers) and chicken shish respectively. Both were served with salad, salsa and rice. The lamb was herby, slightly spicy and succulent and the Mr was in his element. The chicken is chargrilled after being marinated and was very simple, well cooked and not dry at all according to the boys. After that feast we decided to skip desert and grabbed some Turkish delight instead (except for UC as it contained nuts….!) Then it was time to say our goodbyes and head into town for some shopping (the girls) and a trip to the centre for life (the boys). A great place to grab a satisfying lunch in the Toon. I’ve never had a bad meal at Ottoman, but don’t tell the Mr as he would quite happily eat there all the time!